And we have only the American market to blame. The dream of a hotter version of the Ford Focus RS, tentatively titled the RS500, appears to be on life support. Autocar’s sources say the project has a 30% chance of making production, with the main issue being the fact that a beefed-up RS could be too close (in power) to the automaker’s other offerings. “It could be treading on other cars’ toes,” a source told Autocar. Those “other cars” would be the Mustang GT and Mustang Shelby GT350, which make 435 horsepower and 526 horsepower respectively; the RS500 had a rumored power output of 400 horses. We get Ford’s fears and understand why the automaker is hesitant to build the RS500. Not many automakers build special editions of special editions. 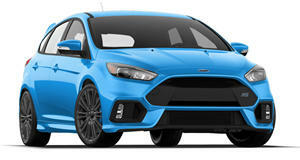 Also, three hot hatches in one model lineup (Focus ST, RS and RS500) sounds a bit too ambitious for America, at least right now. Still, we’d love to see the RS offered in “lite” guise, perhaps as a track-focused monster. We originally said Ford should cut weight instead of adding power. An ultra-limited track edition, something along the lines of the Volkswagen Golf GTI Clubsport S, would let Ford flex its muscles in an atypical way, with power taking a backseat to on-track performance and precision. That being said, 30% is still almost a 1/3 shot, so let’s not write off the Focus RS500 as we know it just yet. Is it even possible to have a midlife crisis with the Focus RS?